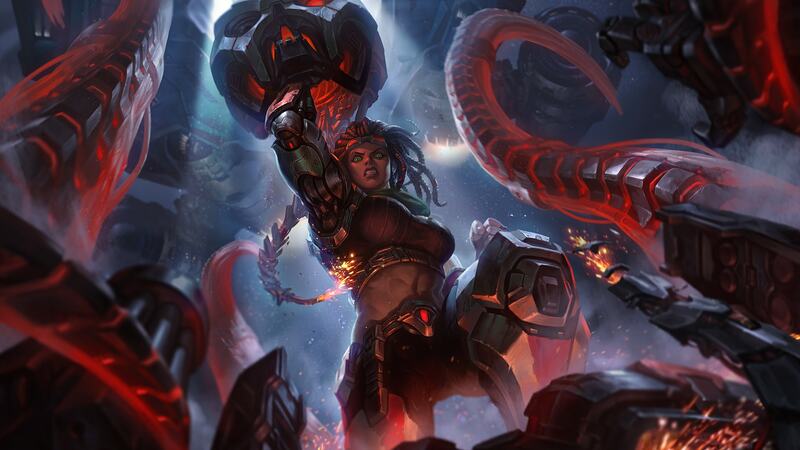 An update on the splash art and SFX for Resistance Illaoi, formerly known as Battlecast Illaoi. It’s getting close to the end of production for the fan-voted Illaoi skin, which means there’s only one update left on the skin’s development. Catch up on the previous posts here. We finally have a name! Introducing: Resistance Illaoi. The name Resistance Illaoi was based on a couple things. First, she isn’t a full Battlecast robot—she is part robot and destroys other robots. Like Blade, except instead of slinging hot vampire-themed one liners, she smashes stuff with glowing robot octopus tentacles. Basically the same thing. 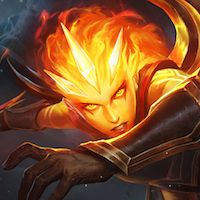 Second, as part of the update to the skin collections, we’re starting to get a better feel for which skins belong in which alternate League fantasies and what factions live in each world. We know there’s a human-led resistance in the Battlecast universe and that Illaoi isn’t a robot, so it felt natural that a part-robot-robot-hunter would best fit in there. That decision left another skin in a sort of “skin-limbo,” which I will call skimbo: Resistance Caitlyn. She has a cool beret and a couple of visual elements that gel with the idea of a guerilla fighting force, but she has no skin line attached to her or presence in the wider League universe. In the end it made sense to kill two birds with one stone—found the Resistance with Resistance Illaoi and officially give Resistance Caitlyn a home in the Battlecast universe. Splash art can takes months to complete. Early in development, the illustrator often starts brainstorming poses, a general theme, and the look of the champion, but as you’ve seen, the skin goes through many iterations before we have a final concept locked. 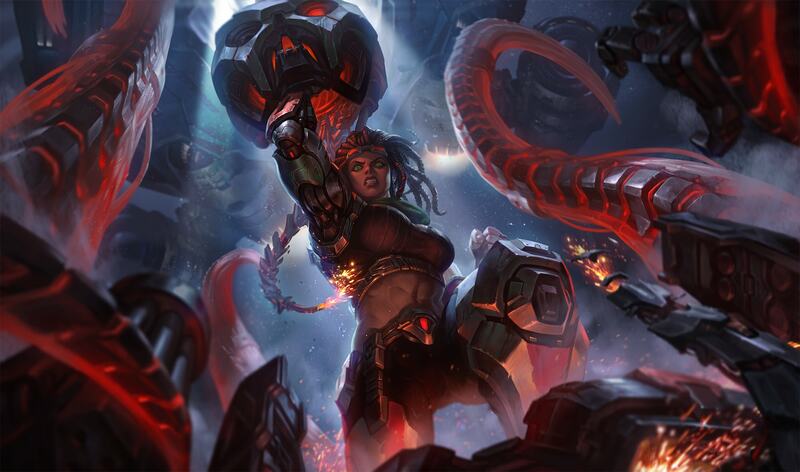 Unless there are major changes to the skin, this will be the final splash for Resistance Illaoi. What important audio reads do you want to maintain from the base? Are there places in the skin where it’s okay to break those rules? If so, where? What does the frequency content of base skin communicate? Do the abilities sound dark and bassy or bright and sizzling? Does the reverb feel “wet,” as if coming to your ears through a long hallway, or “dry,” like it’s so close you feel like you could touch it. We had a lot of questions about Chromas, and we can finally confirm that yes, Resistance Illaoi is getting Chromas! While these are still works in progress, these are the ones we know we’ll be shipping with the skin. We’re considering other colors, so if you have any thoughts, let us know. The final update on Resistance Illaoi will cover polishing her VFX and playtesting the skin to get rid of all (okay most) of those pesky bugs. Then she’ll hit PBE and will hopefully be released sometime in patch 8.5! Riot Zimerfly designs sounds for cool skins and new client features, supplemented by an endless supply of protein shakes. Skins writer and possible Blade fan.